ABOVE: This close-up view of a containership was taken during a Marine Circle Line harbor cruise. INSET PHOTOS BELOW: A "bad hair day" on the Elbe, shipping containers in the port, a Maritime Circle Line boat, a nighttime tour photo, and seating in a summer boat's open bow. Hamburg is, first and foremost, a maritime city--as it has been since the days of the Hanseatic League. 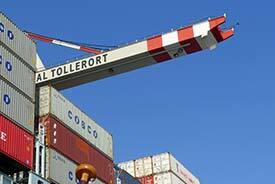 The Port of Hamburg is Europe's third largest, and the biggest in Northern Europe. It's also the main transshipment port for Scandinavia and the Baltic, with goods from China and other distant countries being unloaded from huge containerships and reloaded onto smaller vessels for delivery to Sweden, Poland, the Baltic States, Russia, and other northern countries without deepwater ports on the Atlantic or North Sea. Maritime Circle Line is the aquatic version of a "hop on, hop off" sightseeing bus: Your ticket entitles you to a day of travel between seven museums and other tourist locations in the harbor--among them, the Ballinstadt Emigration Museum, which is a "must see" attraction for visitors from the New World. The Kapitän Prüsse is a vintage sightseeing boat that departs from the St. Pauli Landungsbrücken. Seating is mostly on wooden benches, but the trip is fun, especially at night. (This tour is best if you're familiar with the harbor, because the narration is in German only.) See the tour company's Web site at www.hafenrundfahrt-classic.de. If you feel the urge to get out of town, the high-speed catamaran Halunder Jet or the more traditional cruise boat Atlantis will take you to Helgoland, Germany's island in the North Sea. Both are operated by Helgoline, which departs daily from pier 4 at the Landungsbrücke. For more suggestions on sightseeing by boat, see Hamburg Tourism's "Port and City Tours" page. And for more photos of Hamburg sightseeing boats and ferries, go to page 2 of this article. 1st inset photo copyright © Juergen Bosse. 2nd inset photo copyright © Sascha Burkhard. 4th inset photo copyright © Marc Fischer.